All transactions are safe and secure with a reliable history in online purchasing behind each of our associates. Buy the Roberta Sparrow Donnie Darko t-shirt to own Donnie Darko clothing and merchandise. "Every living creature on earth dies alone," says the reclusive Roberta Sparrow, portrayed in the film by character actress Patience Cleveland. These Donnie Darko t-shirts can be purchased in both men's and women's sizes and in various styles including tank tops and short sleeves. Pictured on the left is the women's long sleeve t-shirt. 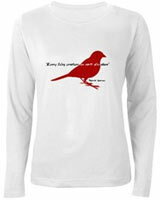 The red sparrow on the tee symbolizes the eerie character of Roberta Sparrow, also known as "Grandma Death". In addition to the Roberta Sparrow Donnie Darko tee above, browse the Donnie Darko Clothing Gallery for more apparel like men's and women's clothes, kids shirts or hoodies.